We wanted to share with you some good news coming out of Wisconsin that validates all the hard work the Tea Party Express did last year in defending Gov. 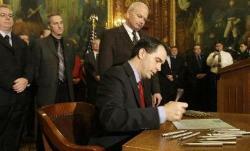 Walker and his fiscally conservative reforms. The unions suffered another loss in Wisconsin, this time at the hands of a federal court of appeals. Last year, we spent much of our time and resources successfully helping to defeat the union led recall effort of Gov. 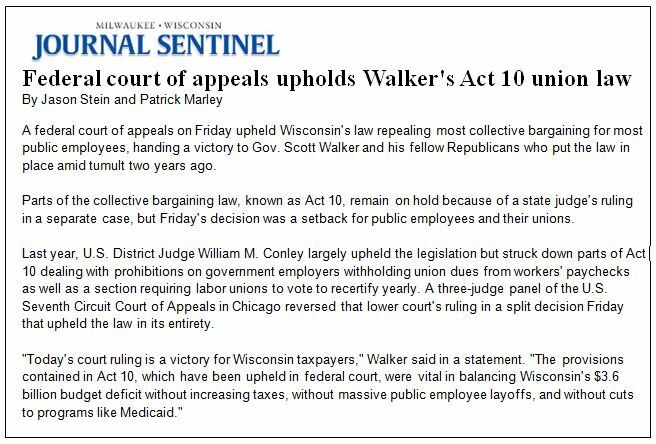 Walker, and now the courts agreed with us that the Scott Walker reforms are legal. As disappointed as we are in the shenanigans in Washington, we have 30 conservative governors around the country who are enacting common-sense, conservative reforms. We are winning important victories across the country, even though the news media barely reports any conservative success. Even though it is taking us more time than we wanted, we have increased the Tea Party support in both the U.S. House and Senate. We continue to get stronger, but it means we have to keep the pressure on. There are a couple of patterns in Wisconsin that we must point out. First, the unions lost when they didn’t get there candidate elected when Gov. Walker won the election to lead the Badger State. Second, the unions wouldn’t give an inch and threw a tantrum when Gov. Walker brought common-sense reforms to Wisconsin that are a model to the rest of the nation as to how to deal with government budgets that are in the red. The unions tried to recall Gov. Walker and, thanks to your help and support, lost. Third, in an act of desperation the unions tried thier hand at a legal challenge to Gov. Walker’s reforms. They just lost their court battle. We can draw two conclusions from this pattern, Gov. Walker is doing the right thing and has turned Wisconsin around AND the unions will stop at nothing to protect their ‘sweetheart deals’ even if it means bankrupting our country. Just as the unions have proven they will never stop fighting, we can’t either and need your support! As we mentioned, just as the unions have proven they will never stop fighting and are well funded, we can’t stop either and need your support to continue to make gains in 2013!